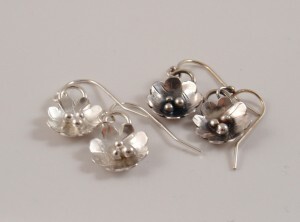 These earrings are one of my best selling items. Dainty sterling silver flowers, completely hand made by me. I’m not sure many people are actually aware of how much work goes into making these. There are a lot of steps involved, and the first step, the shaping of the flower petals, is by far the most time consuming step. 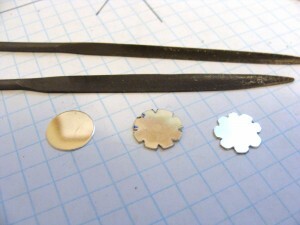 It is possible to purchase “blanks” that are already machine cut into flower shapes. But that would give me less options as far as size and number of petals. It also takes some of the fun out of it, and reduces the handmade value I hold dear. 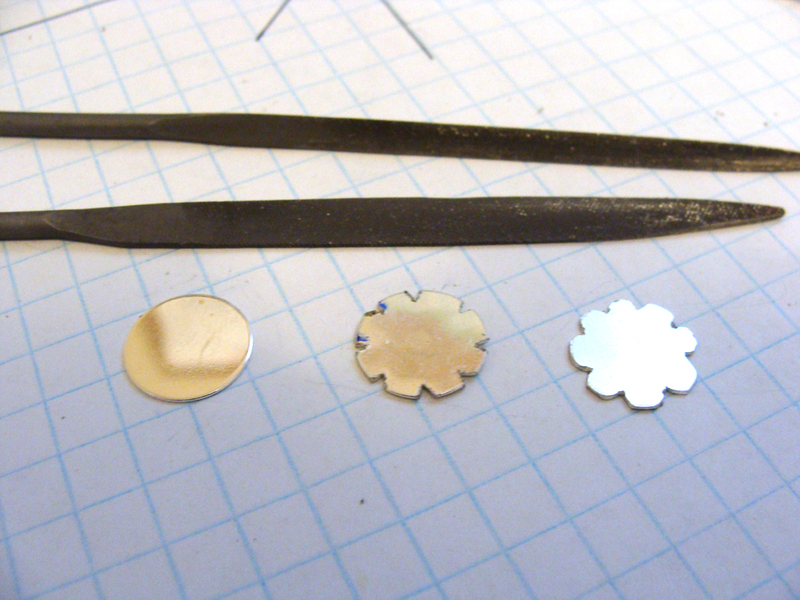 I start with sterling silver discs (or, from sheet, which I cut into discs) and, using a small file, I notch them and shape each petal. 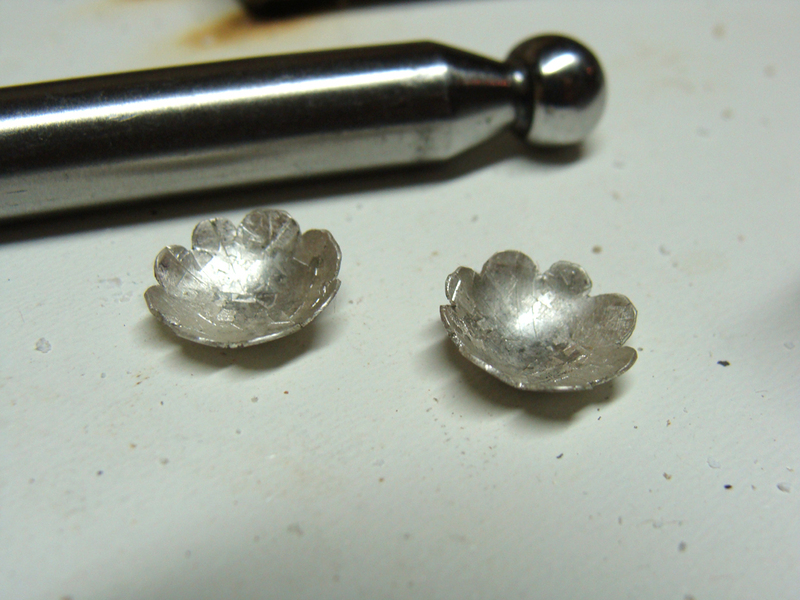 Some petals come out a little bigger than others… that’s the nature of handmade work… and it’s also the nature of “nature”. The discs have to be domed. Fortunately, there’s an easy tool for that! I go through various sized doming punches to get the shape that I want. There’s a hammering step before this one, where I put a bit of a texture on the petals. This is what they look like a few steps later… they’ve been cleaned up, pickled, cleaned up some more, and dipped in liver of sulfur to blacken them. The next step is to remove most of the patina, leaving a darkened look in the recesses, and an overall slightly time-worn appearance. I’ve skipped over showing you a few steps – I didn’t show you the itty bitty silver balls that I make, and solder into the centre of the flower, nor did I show you the attaching of the loop on the back to hang the flowers from earwires. 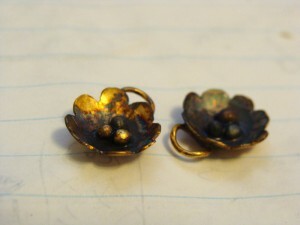 I also make these in a shiny finish, where I skip the patina, and do some extra polishing.